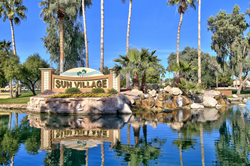 FirstService Residential, Arizona’s leading HOA management company, was selected to provide management services for Sun Village Community Association located in Surprise, Arizona. Sun Village is a 55+ gated community that was previously self-managed before FirstService Residential assumed management responsibilities on June 1, 2018. The community is composed of 1,382 units, including single-family homes and condominiums. Sun Village is located in the northwest valley near Surprise Stadium. The community is also close to a 25-court tennis complex, the Maricopa Regional Library, a fishing lake and the “Field of Dreams” baseball stadium, which is specially designed for handicapped children and adults. Residents of Sun Village enjoy numerous amenities, including golf, tennis, shuffleboard, pickleball, swimming, ceramics and horseshoes. The on-site community center houses community events, shows, clubs and dances. The community center also offers a billiards room, fitness and swimming center, a computer area, sewing room, book and DVD library and meeting rooms. Sun Village also features several facilities that are open to the public, including Chef Peter’s Bistro, The Village Salon, The Gift Gallery and Sun Village Community Church. In Arizona, FirstService Residential is recognized as the leading homeowners association management company in the state, serving over 270 community associations and more than 90,000 households. We offer a comprehensive range of homeowners association and property management services to communities of all types and sizes throughout the state, including the Greater Phoenix and Tucson areas. Ranking Arizona has named FirstService Residential as Arizona’s top choice of HOA management companies for the 13th consecutive year. For more information, visit https://www.fsresidential.com.